Why S.510 Does NOT Protect Local, Natural Food… or Freedom! Senate Bill S 510, the Food Safety Modernization Act, passed the Senate on November 30th, 74-23. Not a single Democrat crossed party lines. This bill is the coup on food in the US. Even though the Tester Amendment was included to dupe those who think it will stop small farmers and processors from being put right out of business, it will only slow down the demise of some small farms. Then it came to light that a Constitutional issue that had been staring all of us in the face was present. The Senate did not pick up HR2749, which passed the House in July of 2009; instead they took up their own monster in S 510. They also began revenue generation in the Senate (Section 107 of the bill), which is expressly forbidden by the Constitution. Faced with a patently un-Constitutional bill, that violates Constitutional process, we have to remain vigilant until BOTH houses have adjourned for the winter recess prior to the next session of Congress. Talk about roller coasters. If the Constitution means anything at all, the House should blue slip S. 510, which would preclude them from taking the bill up and very likely run out the clock for passage in this session. However, there are four choices available for the legislation to move forward before they adjourn on December 24th. The first is for the Senate to bring it back and get unanimous consent to remove the offending section. Since Senator Coburn of Oklahoma will not consent, that avenue is cut off. Second is for the Senate to bust S. 510 down to the original a compromise amendment, remove the funding section and the Tester amendment and try to ram it through the entire senate process again before the 24th. This seems unlikely, but do not trust them as far as you can throw a semi trailer loaded with lead. Third, the Senate could take HR2749, which has already passed the House, and rush it through the Senate, and it would go straight to the Presidents desk with no process with the House necessary. This also seems rather unlikely. The bills are very similar and would have the same detrimental effects for everyone, but the Senators are not familiar with the bill, so it could be really tough. Fourth, the House Ways and Means committee could pass the bill through and forgive the Constitutional infraction and refuse to blue slip the bill, then vote on it before the 24th and we would have the bill albeit there would be legal issues brought forth that could possibly ensnare the regulations they want to write under this bill. This appears to be the most likely potential for S. 510. Make no mistake about this, SB 510, or HR 2749 are worse than the Patriot Act, the Health Care bill, and the Federal Reserve Act combined. We can all live without little pieces of paper, and many of us can live without doctors, and we have been living with the increasing police state since 911, but none of us can live without food and water. If we lose food and water, we will not be able to fight anything else. The largest deception played on the public in S. 510 is the inclusion of the Tester Amendment. This amendment was sold as the complete exemption for all small farms grossing less than $500,000 per year. But if one reads the actual amendment, it is evident that it will not do what it is purported to do for the vast majority of small producers. The Tester Amendment has strident restrictions on those who may be exempted from HACCP (Hazard and Critical Control Point) implementations. HACCP is 50 pages of instructions that require a certifier to sign off on the plan, and a team to be trained in ensuring the plan is followed on the farm. The requirement of this plan put about 40% of small meat processors out of business several years ago. If you fall under the protection of the Tester amendment, you will not have to do it….but let us see how protective the Tester Amendment really is. First, the Tester Amendment purports to exempt farms with less than $500,000 in sales from the requirements of S.510. However, to be exempt one must sell more than 50% of their products directly to consumers or restaurants within a 275-mile radius from production, and keep records substantiating those sales. The records are open for inspection and verification of the exemption. In other words, you have to prove you are playing by their rules through record keeping and approval of those records, or meet the more onerous requirements of S.510. You must apply to be included in the protections of the Tester amendment. You must substantiate through your records for three years that you fit the category of selling more than 50% of average annual monetary value within this 275-mile radius. So, if you sell on the roadside or at a farmers market, you must have a map handy and ask for ID from everyone who purchases from you or lose your exemption. Nice, huh? Proof of Residence for Food? Really? I can see it now….A lovely early June day, with the birds singing and the smell of freshly mown hay hanging in the air like the best memory from childhood. A young mother pulls into the Farmers Market and readies herself for a wonderful shopping experience. She approaches the first stand with her mouth nearly watering at the bright display of fresh produce. I would like 3 cucumbers, please, says the lady with her 3 kids and cloth grocery bag. Great! Can I see your ID? replies the guy in bibs. Oh, I am paying with cash she replies with a smile. No matter, says the farmer, We have to make sure you are within a 275 mile radius of our farm in order to sell to you. She looks perplexed and says, Well, we are not. We are on our way to visit my parents and I wanted to make a special dinner for all of us, using their locally produced foods so they could remember how good home grown veggies are….So I can not buy from you without an ID? The farmer scratches his head and says, Now see, I have to be very careful. I belong to a CSA that sells to a Chipotle that is 276 miles from us, so all of my sales at market have to be local or I lose my exemption and will have to hire 5 people to take care of the paper work and then I just go out of business. So no, I can not sell to you. What is more, all the vendors here are part of the CSA, so no one here can sell to you. You have a nice day now! So please, do not tell me how great the Tester Amendment is, and that the expansive powers being granted to the DoD, DHS, HHS, FDA and USDA in this bill will be helpful to small farmers and local food production and make my food safe. Wake up and smell the coffee!!! Oh, wait. The only state that could produce coffee within 275 miles of itself, is Hawaii. Never mind. Wake up, and smell the tyranny, please. The Left is notorious for their friendly-sounding nomenclature of bills. The American Recovery and Reinvestment Act was the phony stimulus bill; the Patient Protection and Affordable Care Act is Obamacare; Wall Street Reform and Consumer Protection Act is Wall Street regulation. Each of these monstrosities have the same thing in common: they do the exact opposite as they’re advertised. And that’s why S-510, the Food Safety Modernization Act needs to be stopped from turning into law. It goes to the Senate floor for a vote the day after Thanksgiving. This is not the Democratic party that everyone grew up with – it’s been hijacked by some of the most radical, anti-American individuals. Make no mistake, S-510 is no difference than Obamacare. If this passes the Senate, the House has already said they’ll pass it in its current form so it can be sent to the president. Liberals still control the House in this lame duck session, so it’s highly likely that they’ll bundle it up with H.R. 4729, the Food Safety Enhancement Act of 2009, which the House passed and is outline below. If passed, the government will now not only control your health care, but everything you eat. Puts all US food and all US farms under Homeland Security and the Department of Defense in the event of contamination or an ill-defined emergency. Would end US sovereignty over its own food supply by insisting on compliance with the WTO, thus threatening national security. Would allow the government, under Maritime Law, to define the introduction of any food into commerce (even direct sales between individuals) as smuggling into the US. Imposes Codex Alimentarius on the US, a global system of control over food. Would remove the right to clean, store and thus own seed in the US, putting control of seeds in the hands of Monsanto and other multinationals, threatening US security. Includes NAIS, an animal traceability program that threatens all small farmers and ranchers raising animals. Would allow the government to mandate antibiotics, hormones, slaughterhouse waste, pesticides and GMOs. Uses good crimes as the entry into state power and control. $500 annual registration fee on any “facility” that holds, process or manufactures food – “farms” are exempt. Empower the FDA to regulate how crops are raised and harvested – this would eliminate organic farming and lead to the forced purchase of products as mandated by the government. FDA has the power to make random and warrantless searches of the business records of small farmers and local food producers without evidence that there’s even been a violation. The ambiguity is intentional. For example, the power to quarantine a geographic area, including the transportation of food, extends well beyond food safety. 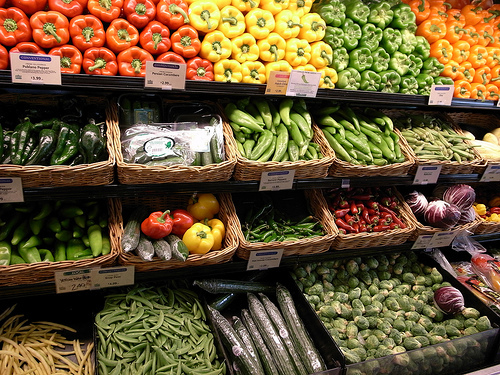 Think about people that go grocery shopping – easily 90% of Americans – they transport food; it has to get home somehow. Notice how individuals and consumers aren’t exempt. That’s because liberals want to control an individuals every move because they feel the individual is incapable of making their own decisions. There is a common trend with the radical liberals in Congress: all bills need to be passed so the country can see what’s in it. Nobody knows who wrote the bill; Congressmen don’t even know what’s in it because special interest groups write the bills on their behalf; can we say shadow government? Or even better, can we say spooky George Soros and his plethora of organizations hell-bent on destroying America. This food bill needs to be stopped. A government that has this much control also has the power to take everything away. Between Obamacare controlling your health care and the food safety bill putting control in the hands of the fourth branch of government – the unelected administrative branch – America is going down a very dangerous path. Unfortunately, this is what the liberals want. Chuck Justice is the editor-in-chief for Habledash. S. 510 will make your food more expensive and less safe. It will drive many small farms out of business. The leaders of the “lame duck” Congress want to pass this falsely named “food safety” bill NEXT WEEK, but . . . They’ll need 60 votes to break Sen. Coburn’s “hold” on the bill. That means we can defeat S.510 with just 40 votes, but we must apply the pressure now! Please send a letter right now telling your Senators to oppose S. 510. You may borrow from or copy this letter . . . S.510 will crush family farms and small businesses with excessive regulations – even though they were NOT the source of recent food safety problems. S.510 also violates the Fourth Amendment by allowing the FDA to invade and search farms and food producers without court permission. If you think the FDA will use this new power responsibly, think again. David Gumpert reports that the FDA shut down two raw-milk cheese-makers for the presence of the pathogen listeria, even though . . . http://tinyurl.com/2e5x2sq * Nobody got sick * The FDA almost never shuts down companies for the mere presence of pathogens – even when people DO get sick * Companies have previously been allowed to clean things up, rather than shut down. If the FDA is starting to behave like this now, just imagine how abusive it will be under S.510? Finally, it must be stressed that big agribusiness has been the source of most recent food safety problems. S.510 will make this problem worse by burdening small producers, and driving them out of business. This will make our food supply more centralized, less diverse, and more dangerous. Please STOP S.510. This Congress must NOT pass any food safety bill. Remember, the voters have repudiated this Congress, and it’s heavy handed ways. END LETTER You can send your letter through DownsizeDC’s Educate the Powerful System. Remember, Congress DOES read your letters. They DO have an impact. The more letters they receive, the more we’re likely to succeed. So please forward this, share on your social networks, and retweet this message: http://twitter.com/#!/DDCDispatch And thank you for being a DC Downsizer! James Wilson Assistant Communications Director DownsizeDC.org D o w n s i z e r – D i s p a t c h Official email newsletter of DownsizeDC.org, Inc. & Downsize DC Foundation. SUPPORT the “Educate the Powerful System”. Feel Free to Forward or Reprint, as long as attribution and action links are retained/included. But we recommend you delete everything in this footer, i.e., below the words “Downsizer-Dispatch”. A Georgia resident who has been an organic farmer for years is now facing $5000 dollars in fines for growing too many vegetables on his OWN land. That’s right. Steve Miller, who has sold some of his produce at local farmers markets, as well as growing food for himself, is likely the victim of an Online Aerial Invasion of Private Property. This invasion of property is probably due to the fact that unless visited or inspected by an official, there would be no way for there to be an accurate or factual accounting of what was going on at Mr. Millers property. The question is, “Does Steve Miller legally posses a reasonable expectation of Privacy on his own Private Property? Recent reports of Local & State Officials and Bureaucrats using online mapping software have now become mainstream tools for assessing fines and generating money for cash strapped local & state budgets. Does it seem right that anywhere that Google Maps & Bing Maps can go is legal to use as a source of information. If a person was bathing in their pool, with every expectation of privacy, and someone peeked over a fence, wouldn’t that constitute a criminal offense? Is the expectation of privacy something the government wants to destroy altogether? Is government today at a point where the end justifies the means? In January and February, when he received his first citations, Steve was able to get the property re-zoned allowing him to grow his garden – a right MOST AMERICANS believe he already had. The Declaration of Independence states one’s inalienable right to Life, Liberty and the Pursuit of Happiness. Isn’t growing your own personal food supply an exercise of that right to Life and Liberty? No Constitutional Government can assess any fee for exercising these inalienable rights. In the recent past, Victory Gardens were encouraged. They were the pride of one’s back yard, and of a Nation that was self-sufficient. The television series The Victory Garden on PBS, documents gardening and provides gardening tips and features vegetable gardens as a great personal achievement. Historically,Victory Gardens in World War II were encouraged to keep the supply of food at a maximum – and personal growing increased the industrial supply to the military. Are people going to let this FASCIST TAKEOVER to continue – even growing a garden in the privacy of our own personal property be taken away? If the answer is NO – then what are you prepared to do about it? Let them know how you feel about this. Derry Brownfield, legendary cattleman, rancher and talk radio host, is heard daily across America bringing his common sense approach to listeners. The farmers' champion and a passionate constitutionalist, Derry takes on big government, mega-corporations, and environmental extremists. From the stock market to the stock yards, from greedy oil companies to the everyday concerns of his loyal audience, no topic is too hot to handle for Derry, who is called "the voice of the heartland". Born during the Great Depression, Derry says we would all be better off if we applied what he learned at a tender age: The best place to find a helping hand is at the end of your own arm! The United States Department of Agriculture (USDA) says it plans to drop the program called the National Animal Identification System (NAIS). I’ve been studying the antics of Washington bureaucrats for 50 years and I know this is just another ploy to give farmers and ranchers a feeling of security, when all the while they are in the process of coming back with a much more draconian plan. The name has been changed and descriptive words have been eliminated and replaced with other objectives, but government continues to push towards turning the control of our livestock industry over to the multinational meat packers. The coyotes howl along the trail but the wagons keep rolling along. The government is also trying to force sale-barns to tag all cows with the “840” tags. “840” indicates the animal originated in the United States. This is to keep us in compliance with the OIE. The United States is no longer in charge of its own policies, rather we are obliged to follow directives of the World Trade Organization (WTO), the Food & Agricultural Organization (FAO), the World Health Organization (WHO), including the Codex Alimentarius and the International Plant Protection Convention. These are all agencies of the United Nations. In December, some Missouri sale-barns began using the NAIS tags. The barn owners said they had been instructed by the Missouri Department of Agriculture to apply these “840” tags to every cow unloaded at the sale barn. After showing them the law prohibiting the state from doing what they had enticed the barn owners to do, a hearing was held in the State Capital to see if the State Veterinarian was abiding by Missouri law. The Missouri State Veterinarian, Taylor Woods, testified that they had no official written policy on the use of the “840” tags. The state officials had no jurisdiction over the barn owners and was pushing the United Nation’s agenda through intimidation. We have been told by government officials that this new approach is going to eliminate any producer that does not have livestock going into interstate commerce. Except for Kansas, Nebraska, and perhaps Colorado, practically all cattle born in the state move across state lines. Missouri for example has one of the largest mother cow herds in the nation – but has no feedlot or slaughter facilities, so about 100% of the calves born in Missouri eventually cross state lines. To understand why the USDA is pushing the “Interstate Commerce Clause” let’s understand the 1942 U.S. Supreme Court decision in Wickard vs Filburn. Claude Wickard was the Secretary of Agriculture at that time and Roscoe Filburn was a wheat grower. Under FDR’s NEW DEAL farmers were allowed to sell a certain amount of wheat. Filburn grew more wheat than he was allowed to market in Interstate Commerce, so the wheat produced in excess of his quota he fed to his livestock. Filburn was found guilty of violating the Interstate Commerce Clause because he fed the wheat to his own livestock; wheat that he had produced on his own land. Wickard assessed a penalty against him but Filburn refused to pay. The Supreme Court ruled against Filburn saying: “If he had not fed the wheat to his livestock he would have been forced to purchase wheat for livestock feed, and that wheat would have crossed state lines, therefore he was involved in Interstate Commerce.” Based upon these facts, if this new “DISEASE TRACEABILITY” plan goes into effect and a farmer butchers his own calf, he is in violation of the Interstate Commerce Clause. Had he not butchered his own calf, he would have been forced to go to the market and buy beef which has crossed state lines. Do you see the restraints big government is trying to place on animal agriculture? Even a local organic farmer, selling produce at a local Farmer’s Market, would be in violation of the Interstate Commerce Clause. Big Agribusiness has taken control of the poultry and egg industry, the pork and milk industries; and if this new and improved DISEASE TRACEABILITY plan becomes law, everything a consumer purchases at the meat and dairy counter will be controlled by no more than a half-dozen large Agribusiness corporations. Our food supply, as we know it, will be a thing of the past. How it’s Made: High-fructose corn syrup (HFCS) is produced by processing corn starch to yield glucose, and then processing the glucose to produce a high percentage of fructose. First, cornstarch is treated with alpha-amylase to produce shorter chains of sugars called polysaccharides. Alpha-amylase is industrially produced by a bacterium, usually Bacillus sp It is purified and then shipped to HFCS manufacturers.Next, an enzyme called glucoamylase breaks the sugar chains down even further to yield the simple sugar glucose. Unlike alpha-amylase, glucoamylase is produced by Aspergillus, a fungus, in a fermentation vat where one would likely see little balls of Aspergillus floating on the top The third enzyme, glucose-isomerase, is very expensive. It converts glucose to a mixture of about 42 percent fructose and 50-52 percent glucose with some other sugars mixed in. While alpha-amylase and glucoamylase are added directly to the slurry, pricey glucose-isomerase is packed into columns and the sugar mixture is then passed over it. Inexpensive alpha-amylase and glucoamylase are used only once, glucose-isomerase is reused until it loses most of its activity. There are two more steps involved. First is a liquid chromatography step that takes the mixture to 90 percent fructose. Finally, this is back-blended with the original mixture to yield a final concentration of about 55 percent fructose–what the industry calls high fructose corn syrup.HFCS has the exact same sweetness and taste as an equal amount of sucrose from cane or beet sugar but it is obviously much more complicated to make, involving vats of murky fermenting liquid, fungus and chemical tweaking, all of which take place in one of 16 chemical plants located in the Corn Belt. Yet in spite of all the special enzymes required, HFCS is actually cheaper than sugar. It is also very easy to transport–it’s just piped into tanker trucks. This translates into lower costs and higher profits for food producers. Why It’s Bad Besides the way it’s made, there’s a couple of other murky things that consumers should know about HFCS. According to a food technology expert, two of the enzymes used, alpha-amylase and glucose-isomerase, are genetically modified to make them more stable. Enzymes are actually very large proteins and through genetic modification specific amino acids in the enzymes are changed or replaced so the enzyme’s “backbone” won’t break down or unfold. This allows the industry to get the enzymes to higher temperatures before they become unstable. Consumers trying to avoid genetically modified foods should avoid HFCS But there’s another reason to avoid HFCS. Consumers may think that because it contains fructose–which they associate with fruit, which is a natural food–that it is healthier than sugar. A team of investigators at the USDA, led by Dr. Meira Field, has discovered that this just ain’t so. Sucrose is composed of glucose and fructose. When sugar is given to rats in high amounts, the rats develop multiple health problems, especially when the rats were deficient in certain nutrients, such as copper. The researchers wanted to know whether it was the fructose or the glucose moiety that was causing the problems. So they repeated their studies with two groups of rats, one given high amounts of glucose and one given high amounts of fructose. The glucose group was unaffected but the fructose group had disastrous results. The male rats did not reach adulthood. They had anemia, high cholesterol and heart hypertrophy–that means that their hearts enlarged until they exploded. They also had delayed testicular development. Dr. Field explains that fructose in combination with copper deficiency in the growing animal interferes with collagen production. (Copper deficiency, by the way, is widespread in America.) In a nutshell, the little bodies of the rats just fell apart. The females were not so affected, but they were unable to produce live young. “The medical profession thinks fructose is better for diabetics than sugar,” says Dr. Field, “but every cell in the body can metabolize glucose. However, all fructose must be metabolized in the liver. The livers of the rats on the high fructose diet looked like the livers of alcoholics, plugged with fat and cirrhotic.” HFCS contains more fructose than sugar and this fructose is more immediately available because it is not bound up in sucrose. Since the effects of fructose are most severe in the growing organism, we need to think carefully about what kind of sweeteners we give to our children. Fruit juices should be strictly avoided–they are very high in fructose–but so should anything with HFCS. Interestingly, although HFCS is used in many products aimed at children, it is not used in baby formula, even though it would probably save the manufactueres a few pennies for each can. Do the formula makers know something they aren’t telling us? Pretty murky! Among other consequences, HFCS has been implicated in elevated blood cholesterol levels and the creation of blood clots. It has been found to inhibit the action of white blood cells so that they are unable to defend the body against harmful foreign invaders.8 This is the first step for glucose to enter a cell and be metabolized. As a result, the body needs to pump out more insulin to handle the same amount of glucose.21 Fructose reduces the affinity of insulin for its receptor, which is the hallmark of type-2 diabetes. Fructose interacts with oral contraceptives and elevates insulin levels in women on “the pill.” 17 Because it is metabolized by the liver, fructose does not cause the pancreas to release insulin the way it normally does. Fructose converts to fat more than any other sugar. This may be one of the reasons Americans continue to get fatter. Fructose raises serum triglycerides significantly. As a left-handed sugar, fructose digestion is very low. For complete internal conversion of fructose into glucose and acetates, it must rob ATP energy stores from the liver.21 Not only does fructose have more damaging effects in the presence of copper deficiency, fructose also inhibits copper metabolism–another example of the sweeteners double-whammy effect. A deficiency in copper leads to bone fragility, anemia, defects of the connective tissue, arteries, and bone, infertility, heart arrhythmias, high cholesterol levels, heart attacks, and an inability to control blood sugar levels.22 . It is almost certainly made from genetically modified corn and then it is processed with genetically modified enzymes. I’ve seen some estimates claiming that virtually everything–almost 80 percent–of what we eat today has been genetically modified at some point. Since the use of HFCS is so prevalent in processed foods, those figures may be right. It is not every day you find Amish farmers serving raw milk in the U.S. Senate. But this week a group of libertarian, small, sustainable, organic farmers were serving up the unpasteurized milk–which the U.S. Food and Drug Administration (FDA) deems dangerous–to Senate staff and local food advocates as part of an effort to push back against pending federal food safety regulations. Raw Jersey Cow Milk from Amish Farms, Pennsylvania being served in the Dirksen Senate office building. The National Independent Consumers and Farmers Association (NICFA), whose mission is to “promote and preserve unregulated direct farmer-to-consumer trade,” organized a lobby day Wednesday to rally opposition to the Senate FDA Food Safety Modernization Act (S. 510), a bill that would increase FDA inspections of food facilities and give the agency mandatory recall authority. It is unclear exactly how or where NICFA fits into the lobbying scene. Most food policy experts inside the beltway know very little about the organization, and many characterize NICFA as a fringe group. The National Sustainable Agriculture Association (NSAC), an active force for sustainable agriculture in DC, doesn’t work with NICFA. It is also unclear how any members NICFA has or who exactly funds the organization. Many food policy insiders suspect the Weston A. Price foundation, a non-profit proponent of raw milk and whole foods, gives the group financial support. A spokesperson for NICFA said the group is funded exclusively through private donations but declined to provide any details. Curious as NICFA may be, their reception on Wednesday had some libertarian star power. Former presidential candidate and small government hero Congressman Ron Paul (R-TX) kicked off the reception with his usual stump speech and Joel Salatin, a farmer-turned-celebrity, for his appearance in best-selling Omnivore’s Dilemma and Oscar-nominated Food, Inc., emceed the event. 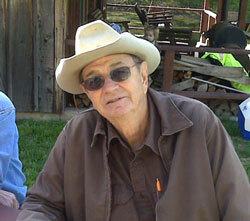 Joel Salatin, of Polyface Farms (seated), and Congressman Ron Paul (R-TX). Photos by Helena Bottemiller. Salatin, a self-described “Christian-libertarian-environmentalist-lunatic farmer,” fired off a number of clever sound bites to his audience, which appeared to be mostly NICFA members. Though the event piqued the curiosity of many food policy wonks, no one seems concerned NICFA’s efforts could derail S. 510, a bill that enjoys broad, bipartisan support, but has yet to be scheduled for a vote. David Gumpert, a health blogger and author of The Raw Milk Revolution who also spoke at the reception, indicated on his blog this week that the response to NICFA’s message was hard to gauge. “Most discouraging was that the aides seemed not to know very much about key problems in the food safety legislation–the absence of significant exemptions for the smallest food producers and farms, the huge financial burden imposed by the requirement for HACCP (hazard analysis critical control point) plans, and the imposition of Good Agricultural Practices (GAP) standards on farmers,” he added. Consumer and public health advocates have been insisting for months that though they are open to “scale-appropriate” food safety regulations, no food grower or processor should be exempt from the food safety system. “We do have issues with anything that provides any blanket exemptions,” Sandra Eskin, director of the food safety campaign with The Pew Charitable Trusts, recently told Food Safety News. Pew is a key member of the Make Our Food Safe coalition (MOFS), a broad coalition of consumer, public health, and industry groups pushing for the passage of S. 510. “Food should be safe regardless of its source — big processor, small farm, conventional operation or organic grower,” said Eskin. Dr. W. Ron DeHaven is CEO of the American Veterinary Medical Assn. USDA Sec. Vilsack announced during the morning of Feb. 5 that NAIS was over, ended, no more. His customary emotionless announcement was fairly brief, but the detailed USDA Factsheet (Click here for factsheet) released simultaneously required seven pages of small print describing the animal ID “will do’s” and “won’t do’s”–all of which will be enforced at some future date in a to-be-determined manner. At once thousands of emails flew from around the globe with nearly as much excitement outside the US as the home land. Ranch and cattle producers smiled and nodded. But it seems the victory may be short lived. Now comes a lone government employee saying he cannot endorse Sec. Vilsack’s new announcement. Dr. W. Ron DeHaven is CEO of the American Veterinary Medical Assn. The US veterinarian head count is 100,728 licensed practitioners; of which 930 are Federal Veterinarians, employed by APHIS, and 23 are Homeland Security staff veterinarians. DeHaven’s “public resistance” is the overwhelming majority of livestock producers who opposed the NAIS for a list of reasons that would choke a giraffe. According to DeHaven, the mag-daddy of veterinarians, none of these “resistors” should have had any voice in the NAIS’s demise, and Secretary Vilsack should not have listened to them. One gets the feeling he would like to see Vilsack go away, and himself take control. Evidently unknown to DeHaven, the US has been a net importer of beef for the last 21 years. Last year, the country exported $2,183,977,168 in beef and imported $4,857,454,008. We haven’t produced enough beef to feed the nation in 21 years, yet DeHaven confidently testified that future exports are imperative. From this statement, it would appear DeHaven has never processed an interstate veterinarian animal health certificate. An animal is sold into another state. The state receiving the animal has “states rights” and determines the rules of entry. The owner of the sold animal contacts their local veterinarian. The vet has an “Entry Permit Acquisition Book” with phone numbers of every US state and tribe, provided by the USDA. They call the state vet office of destination, talk to an authorized person, receive the required protocol, do what ever health tests are required for entry, complete a standard animal health certificate, receive a permit number to enter the state, and the critter is ready to travel. This health certificate has four copies of different colors. They forward one copy on to the receiving state vet. The receiving state has a staff of people who check these incoming certificates every day, and may actually go and inspect the animals after arrival if they have concern. This has been established and is already done. No animals travel across state lines without ID and a health certificate, and nothing is new about that. This is a system that has worked for a lifetime, and Vilsack understands the total cost to USDA is zero to continue this process. This system has been used successfully during every major outbreak of livestock disease in our history. The attempt to shove NAIS down the throat of every livestock producer in the U.S. will-not-be-forgotten, and the USDA may try to resurrect and rename it again–the Every Animal Traceability Tax, (EATT), or the No Cow Left Behind (NCLB)–but the results will be the same. And another bureaucrat like DeHaven will stand up before some Congressional committee and pretend there is this huge, dangerous, animal disease mountain to climb and that without a NAIS, the food safety of the nation will be imperiled. Hopefully, that bureaucrat will have enough sense to know we already have a successful interstate commerce system in place, and that all it takes for a producer to comply is to make a phone call to the destination state and do what the receiving state asks. The Associated Press misreported this morning that “The USDA Abandons Stalled Animal ID Program.” A press release issued last Friday by the USDA hints at another fate. Agriculture Secretary Vilsack announced that USDA will develop a new, flexible framework for animal disease traceability in the United States, and undertake several other actions to further strengthen its disease prevention and response capabilities. So they’re trying to re-invent the program, make it more palatable to people who signaled their willingness to stand at the farm gate, armed and dangerous, to prevent any part of a government mandated NAIS from creeping into their business. If the USDA has trouble reading the tea leaves, let Lorrie Morgan explain it to you. The feedback he was talking about was clear, painfully so. Excruciatingly obvious. As plain as the nose on an anteater’s face. Most every small farmer and rancher responded with the kind of “cold, dead fingers” response that would gladden the heart of Charlton Heston. Not to repeat myself but I attended two listening sessions; Jeff City and Omaha. The one lone pro-NAIS speaker in Jeff City never finished his spiel. Fearing for his safety, he fled a very hostile audience in mid-speech. The Omaha crowd wasn’t nearly as angry but their message was the same. * Be implemented transparently through federal regulations and the full rulemaking process. May I call on Lorrie Morgan, again? The USDA will convene a forum with animal health leaders for the States and Tribal Nations to initiate a dialogue about ‘possible ways of achieving the flexible, coordinated approach to animal disease traceability we envision.’ Let’s hope they invite all the stakeholders and be prepared to duck and cover. Chuck Jolley is a free lance writer, based in Kansas City, who covers a wide range of ag industry topics for Cattlenetwork.com and Agnetwork.com. In the coming months and years, self sufficiency will be the most important concept to our survival. In fact the words survival and self sufficiency are interchangeable and synonymous. The idea of self sufficiency and survival are hard and harsh concepts to Americans who are in every way dependent on the system. I fear that most may one day be very hungry and forced to resort to stealing their food. I have often remarked that an honest man will steal if he and his family are hungry. And if desperate enough, he may plunder or may even kill. The only exception to this is the age group that was born in the 1930s. This small group could easily revert to the land without having a nervous breakdown. If you have ever watched the movie, Gone With the Wind, you remember the desperate conditions people endured just after the Civil War. Prior to the war Scarlet O’Hara had the finest things that life in the Old South could give, but the war and devastation reduced her to poverty. When the war was over she still had the land. But with everything gone except the land, Scarlet was reduced to living on turnips and whatever she could grow literally with her hands. That scene happened for real in Germany during World War I. Turnips became survival. For more on food and water storage, and everything you need to prepare for the hard times that are coming, see my special report, How to Survive the Collapse of Civilization. But this doesn’t have to happen to you if you take small but determined action while there is yet time. Oh, you have trouble believing that Scarlet’s plight could happen to you? Suppose you take my suggestion and prepare, and of all horrors, nothing bad happens? Well, everything that you have done to prepare—everything you have stored—you can consume. Plus, you will have on hand food bought before the coming inflation makes limited food available at very high prices. Most low-income people are having trouble getting affordable food now. Look around and you will see all the people who are overweight because they only get mostly low-cost high-carbohydrate food. What food items to store? Try to store food that has shelf-life and always rotate it. I bought a ton of brown rice 40 years ago and I am still eating it, after raising my children on it. I used diatomaceous earth to preserve it. Diatomaceous earth dehydrates bugs in grains. Canned goods—fruits, vegetables and meats—have an expiration date. Buy extra every trip you make to the grocery store and be sure your rotate your stock to use the oldest first. There are food kits available online and in some survival/outdoor stores that will sustain you through emergencies. Some of these contain all you need for survival and are marked to show how many people can survive off the food included and for how long. How much to store? That is an individual problem and a difficult question that contains no set answer. The best bet is to watch what your family eats in a week and make note of it (how many servings of meat, vegetables, fruit and grains). Then you’ll have an idea of how much must be set aside for each week you think an emergency might exist. As for water, experts say each person needs about two gallons per day for drinking, cooking and hygiene. A minimum of three days supply should be kept on hand, and more is better. Store seeds in your refrigerator. All who want a garden should store natural seeds, not hybrid seeds. Store some each year from your crop. (Editor’s note: For more detailed information on surviving food and water shortages and more, see my special report, How to Survive the Collapse of Civilization. I have also reviewed an excellent book on food and water storage entitled Emergency Food Storage and Survival Handbook. Click on the title to read the review and for a link to purchase the book. You are currently browsing the archives for the Food category.